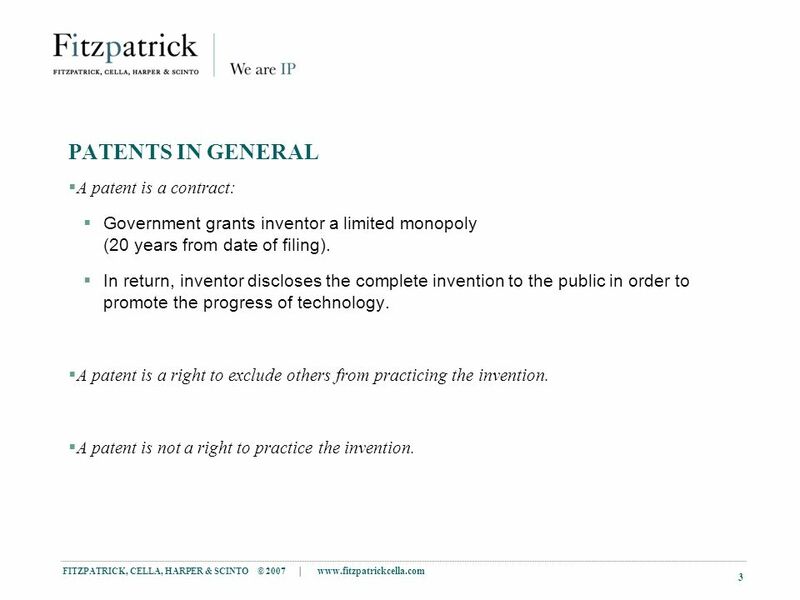 3 FITZPATRICK, CELLA, HARPER & SCINTO © 2007 | www.fitzpatrickcella.com 3 PATENTS IN GENERAL A patent is a contract: Government grants inventor a limited monopoly (20 years from date of filing). In return, inventor discloses the complete invention to the public in order to promote the progress of technology. A patent is a right to exclude others from practicing the invention. 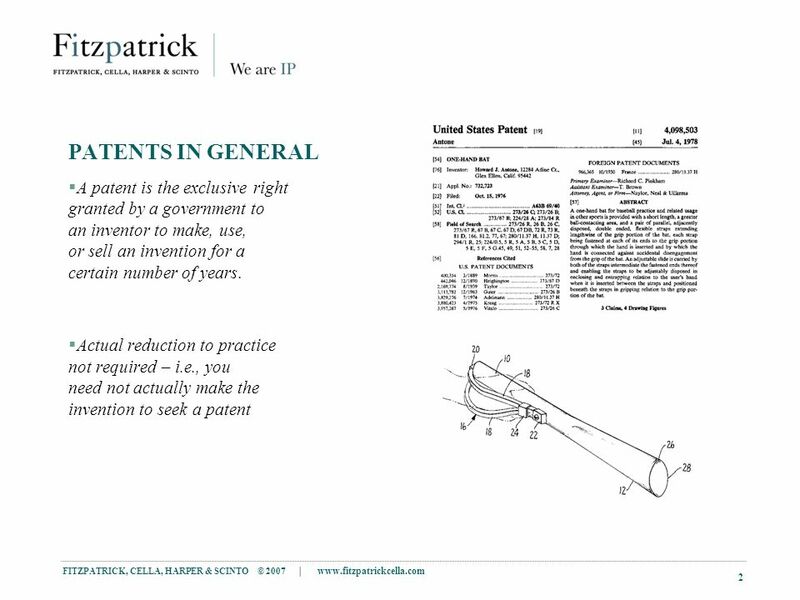 A patent is not a right to practice the invention. 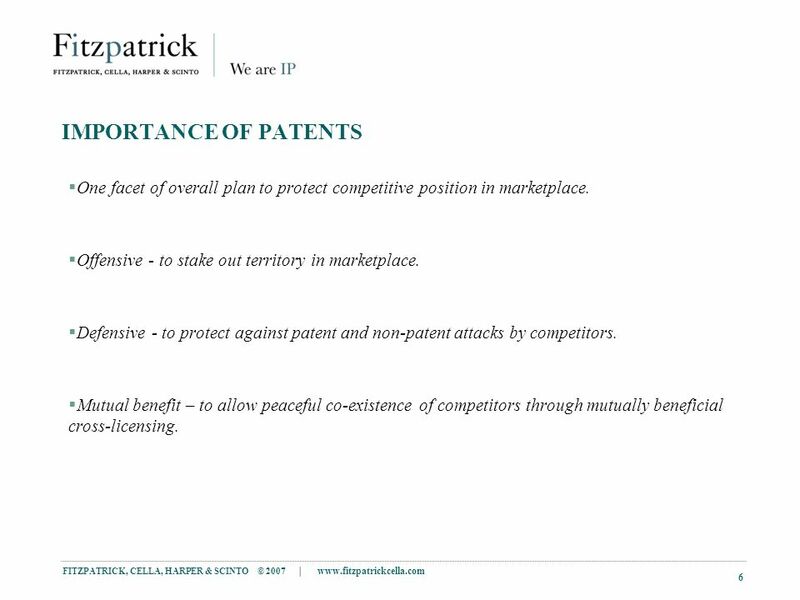 6 FITZPATRICK, CELLA, HARPER & SCINTO © 2007 | www.fitzpatrickcella.com 6 IMPORTANCE OF PATENTS One facet of overall plan to protect competitive position in marketplace. Offensive - to stake out territory in marketplace. Defensive - to protect against patent and non-patent attacks by competitors. Mutual benefit – to allow peaceful co-existence of competitors through mutually beneficial cross-licensing. 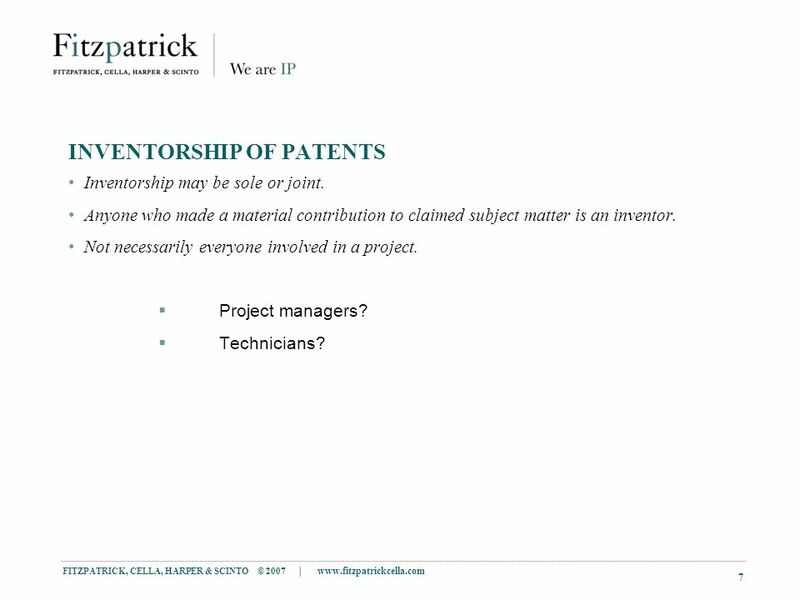 7 FITZPATRICK, CELLA, HARPER & SCINTO © 2007 | www.fitzpatrickcella.com 7 INVENTORSHIP OF PATENTS Inventorship may be sole or joint. Anyone who made a material contribution to claimed subject matter is an inventor. Not necessarily everyone involved in a project. Project managers? Technicians? 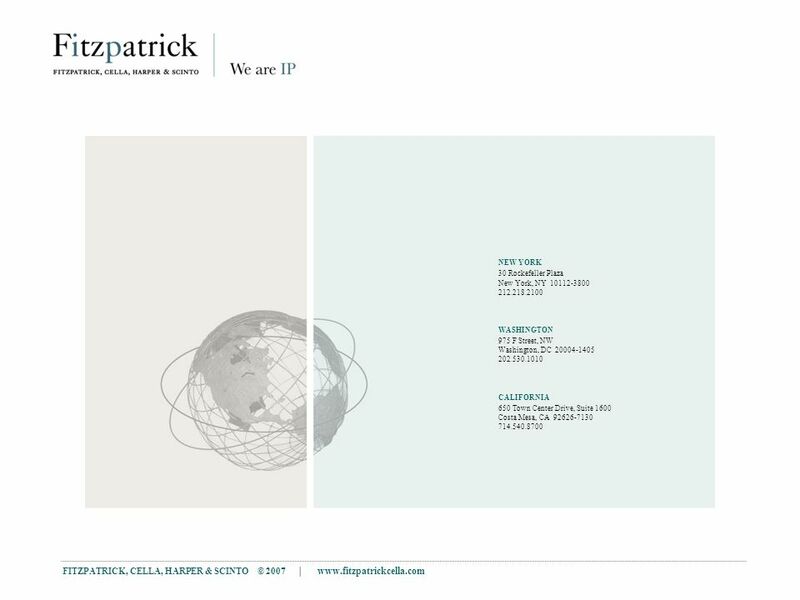 8 FITZPATRICK, CELLA, HARPER & SCINTO © 2007 | www.fitzpatrickcella.com 8 OWNERSHIP OF PATENTS Patent applications are filed in the name(s) of, and initially owned by, the inventor(s). Employer-employee agreements wherein employee agrees to assign all rights in invention to employer. 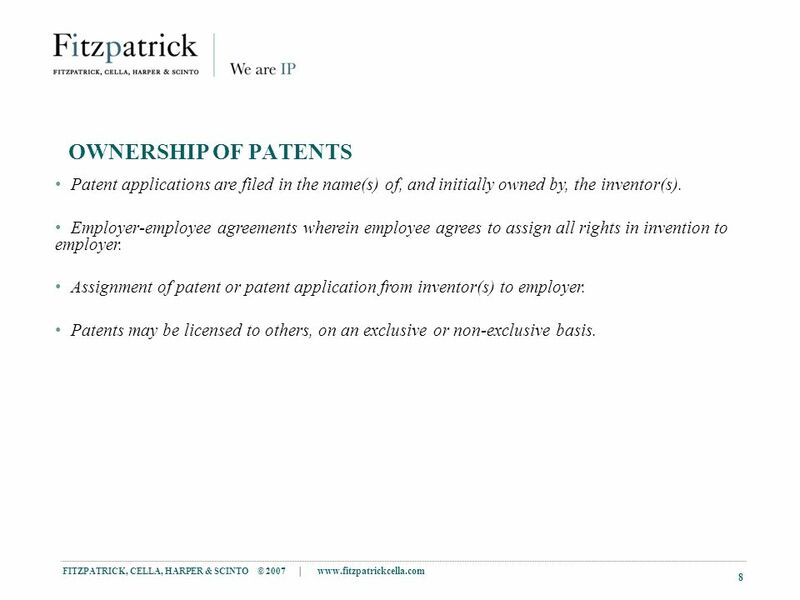 Assignment of patent or patent application from inventor(s) to employer. Patents may be licensed to others, on an exclusive or non-exclusive basis. 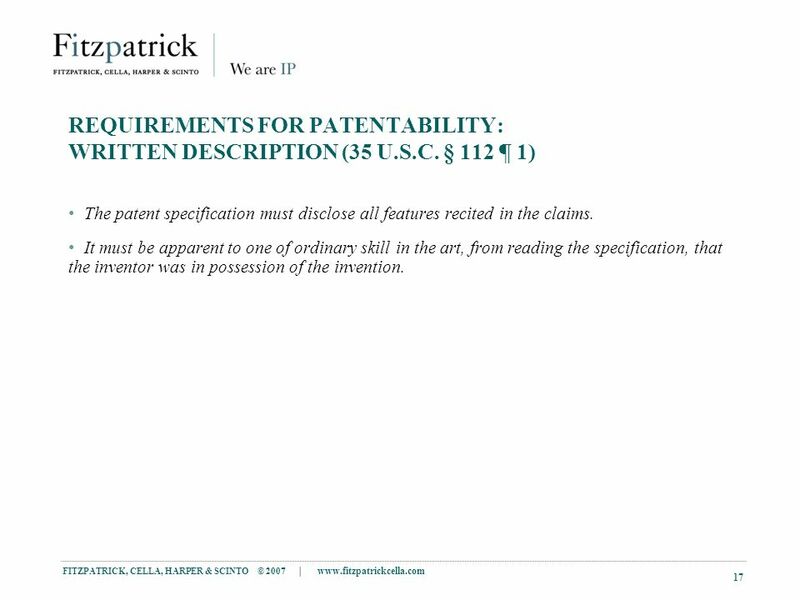 9 FITZPATRICK, CELLA, HARPER & SCINTO © 2007 | www.fitzpatrickcella.com 9 PARTS OF A PATENT APPLICATION Specification. Claims. Drawings. Abstract of the Disclosure. Declaration of Inventor(s). Power of Attorney. Assignment. Filing Fee. 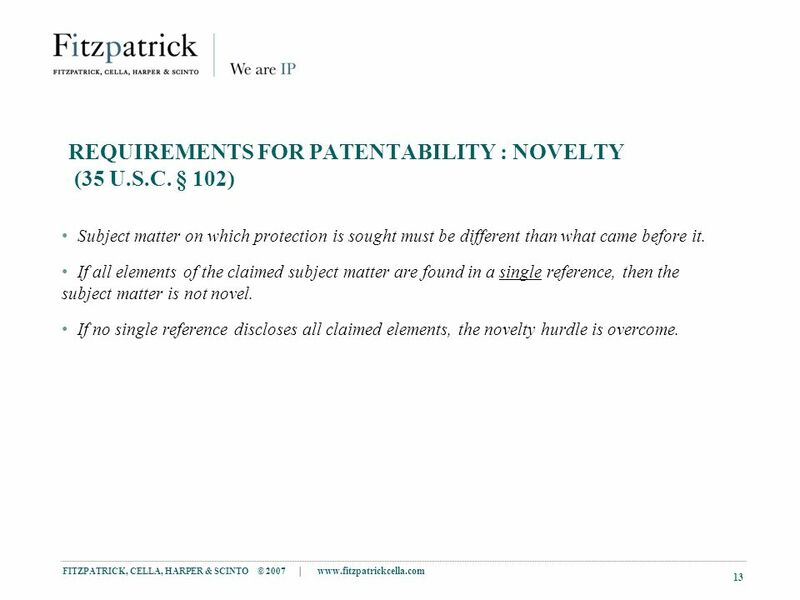 13 FITZPATRICK, CELLA, HARPER & SCINTO © 2007 | www.fitzpatrickcella.com 13 REQUIREMENTS FOR PATENTABILITY : NOVELTY (35 U.S.C. § 102) Subject matter on which protection is sought must be different than what came before it. If all elements of the claimed subject matter are found in a single reference, then the subject matter is not novel. If no single reference discloses all claimed elements, the novelty hurdle is overcome. 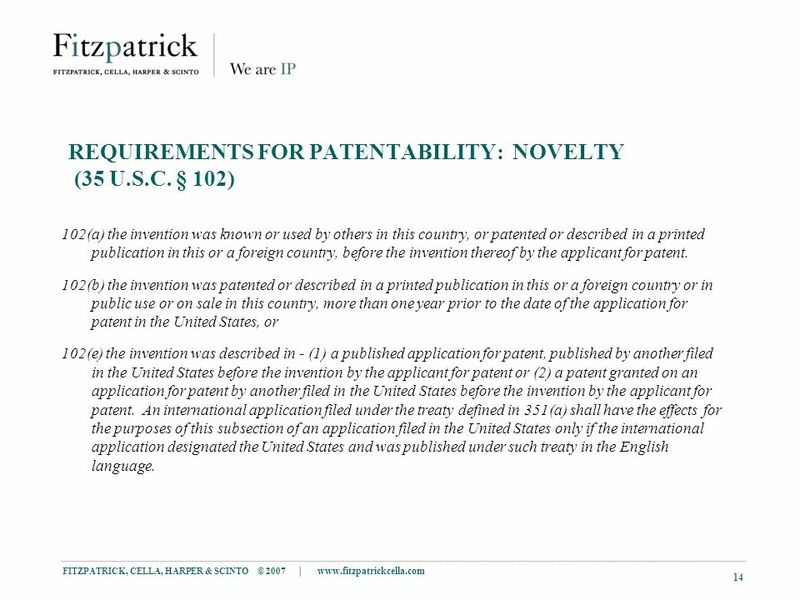 14 FITZPATRICK, CELLA, HARPER & SCINTO © 2007 | www.fitzpatrickcella.com 14 REQUIREMENTS FOR PATENTABILITY: NOVELTY (35 U.S.C. § 102) 102(a) the invention was known or used by others in this country, or patented or described in a printed publication in this or a foreign country, before the invention thereof by the applicant for patent. 102(b) the invention was patented or described in a printed publication in this or a foreign country or in public use or on sale in this country, more than one year prior to the date of the application for patent in the United States, or 102(e) the invention was described in - (1) a published application for patent, published by another filed in the United States before the invention by the applicant for patent or (2) a patent granted on an application for patent by another filed in the United States before the invention by the applicant for patent. An international application filed under the treaty defined in 351(a) shall have the effects for the purposes of this subsection of an application filed in the United States only if the international application designated the United States and was published under such treaty in the English language. 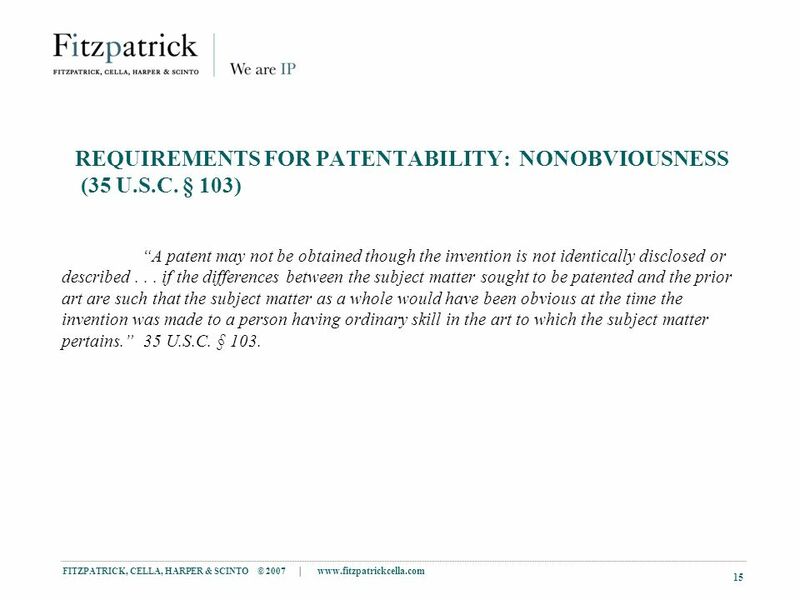 15 FITZPATRICK, CELLA, HARPER & SCINTO © 2007 | www.fitzpatrickcella.com 15 REQUIREMENTS FOR PATENTABILITY: NONOBVIOUSNESS (35 U.S.C. 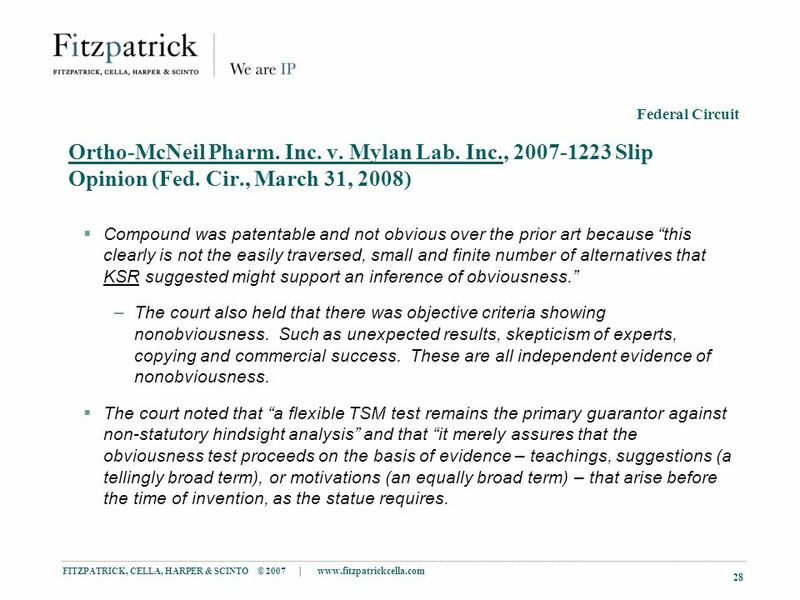 § 103) A patent may not be obtained though the invention is not identically disclosed or described... if the differences between the subject matter sought to be patented and the prior art are such that the subject matter as a whole would have been obvious at the time the invention was made to a person having ordinary skill in the art to which the subject matter pertains. 35 U.S.C. § 103. 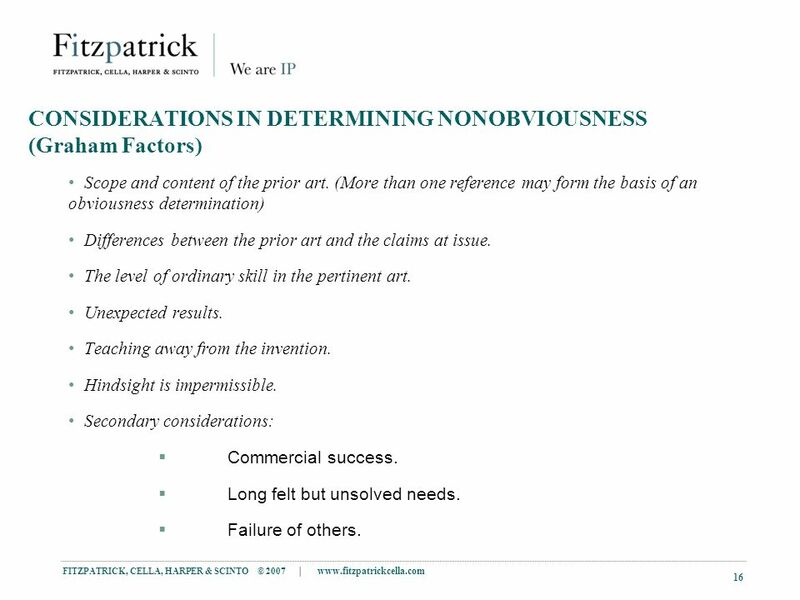 16 FITZPATRICK, CELLA, HARPER & SCINTO © 2007 | www.fitzpatrickcella.com 16 CONSIDERATIONS IN DETERMINING NONOBVIOUSNESS (Graham Factors) Scope and content of the prior art. 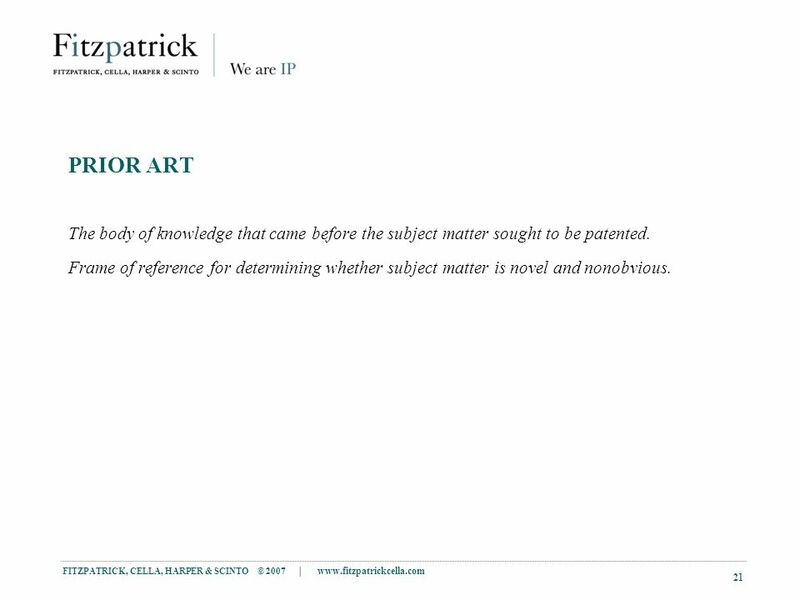 (More than one reference may form the basis of an obviousness determination) Differences between the prior art and the claims at issue. The level of ordinary skill in the pertinent art. Unexpected results. Teaching away from the invention. Hindsight is impermissible. Secondary considerations: Commercial success. Long felt but unsolved needs. Failure of others. 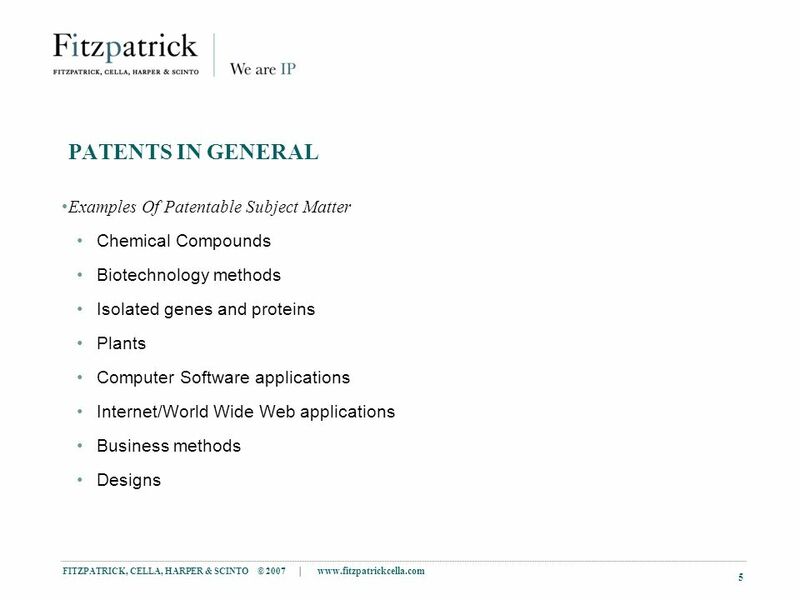 17 FITZPATRICK, CELLA, HARPER & SCINTO © 2007 | www.fitzpatrickcella.com 17 REQUIREMENTS FOR PATENTABILITY: WRITTEN DESCRIPTION (35 U.S.C. 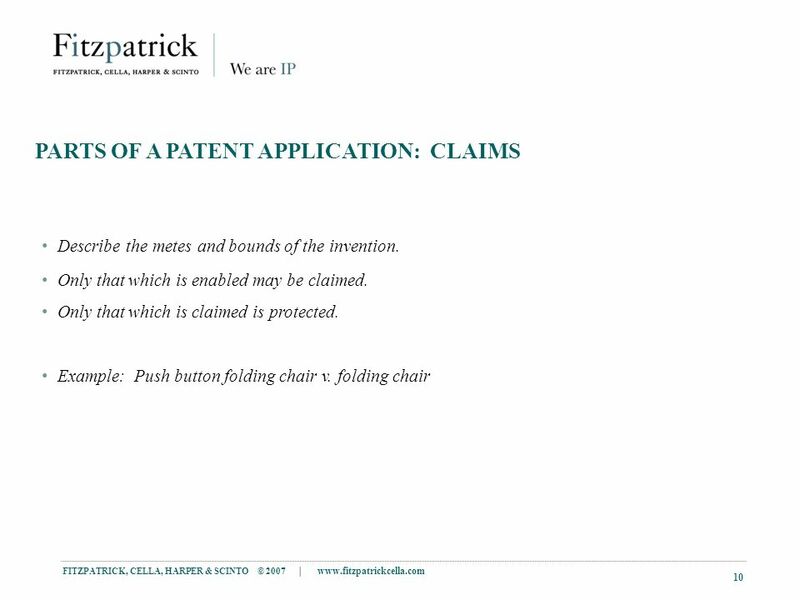 § 112 ¶ 1) The patent specification must disclose all features recited in the claims. It must be apparent to one of ordinary skill in the art, from reading the specification, that the inventor was in possession of the invention. 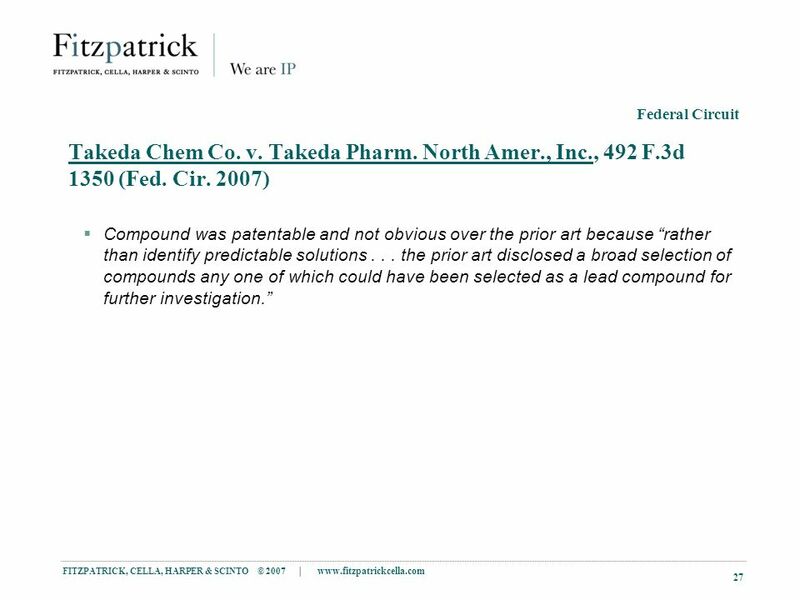 18 FITZPATRICK, CELLA, HARPER & SCINTO © 2007 | www.fitzpatrickcella.com 18 REQUIREMENT FOR PATENTABILITY: ENABLEMENT (35 U.S.C. 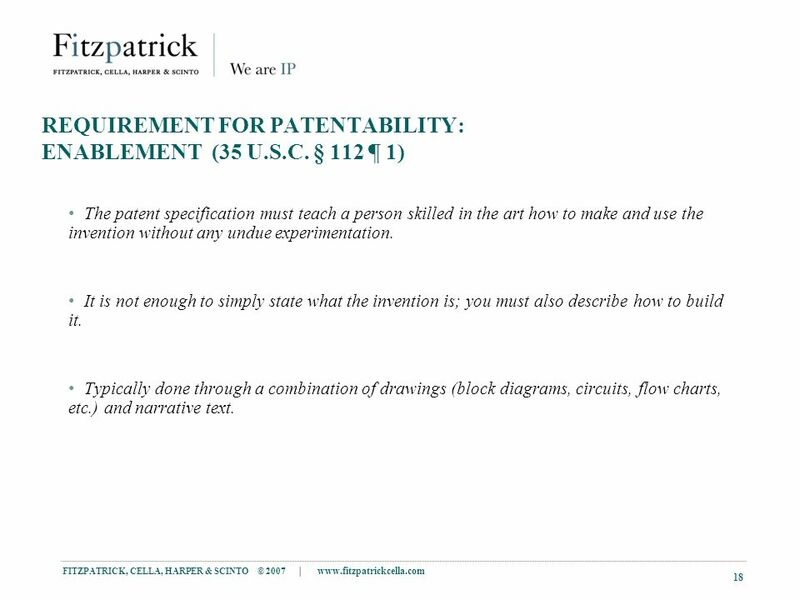 § 112 ¶ 1) The patent specification must teach a person skilled in the art how to make and use the invention without any undue experimentation. It is not enough to simply state what the invention is; you must also describe how to build it. Typically done through a combination of drawings (block diagrams, circuits, flow charts, etc.) and narrative text. 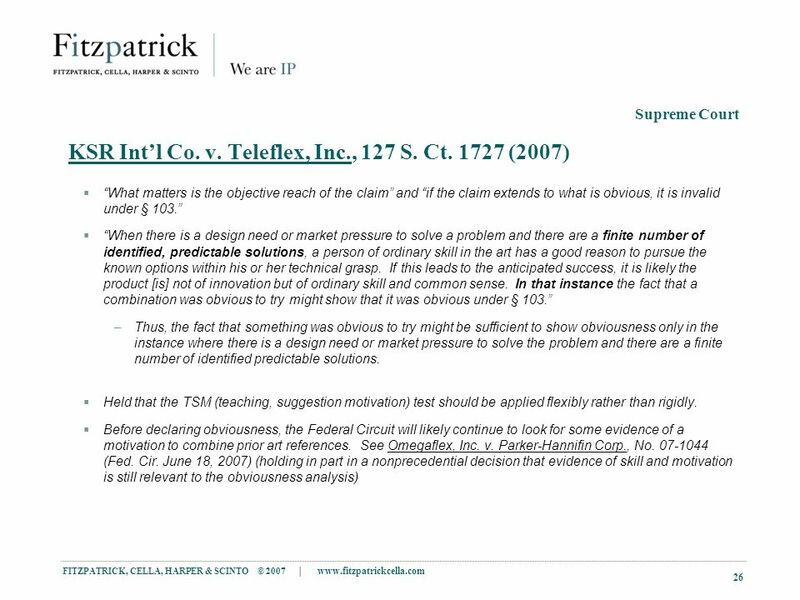 19 FITZPATRICK, CELLA, HARPER & SCINTO © 2007 | www.fitzpatrickcella.com 19 REQUIREMENT FOR PATENTABILITY: BEST MODE (35 U.S.C. § 112 ¶ 1) The specification... shall set forth the best mode contemplated by the inventor of carrying out the invention. 35 U.S.C. § 112. 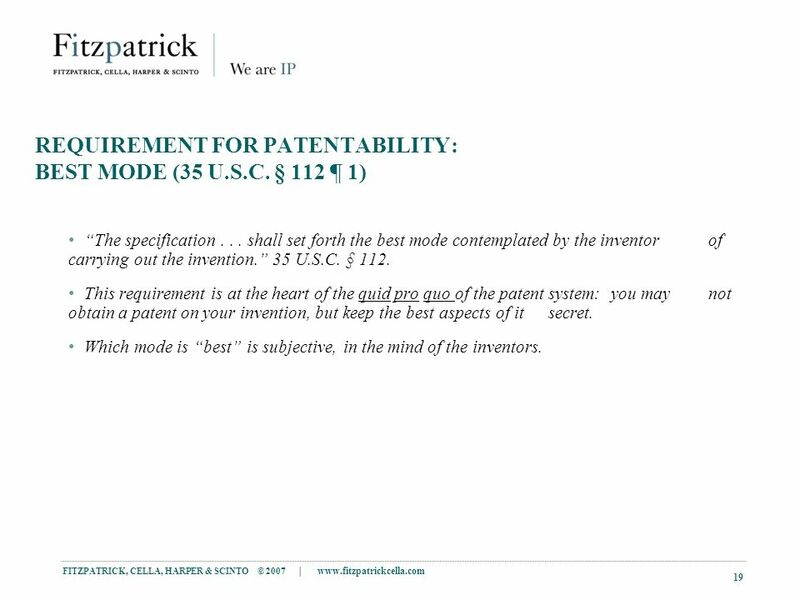 This requirement is at the heart of the quid pro quo of the patent system: you may not obtain a patent on your invention, but keep the best aspects of it secret. Which mode is best is subjective, in the mind of the inventors. 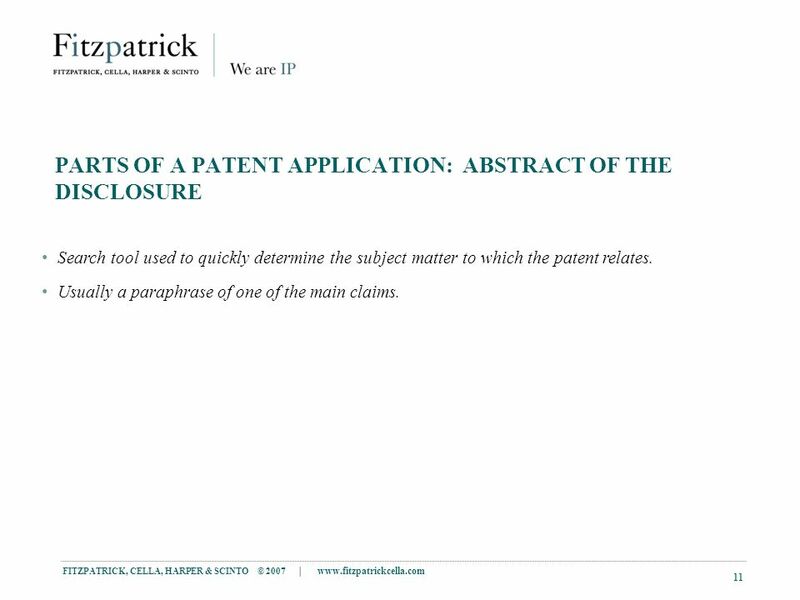 20 FITZPATRICK, CELLA, HARPER & SCINTO © 2007 | www.fitzpatrickcella.com 20 RELEVANT DATES FOR PRIOR ART [B]efore the invention thereof by the applicant for patent. 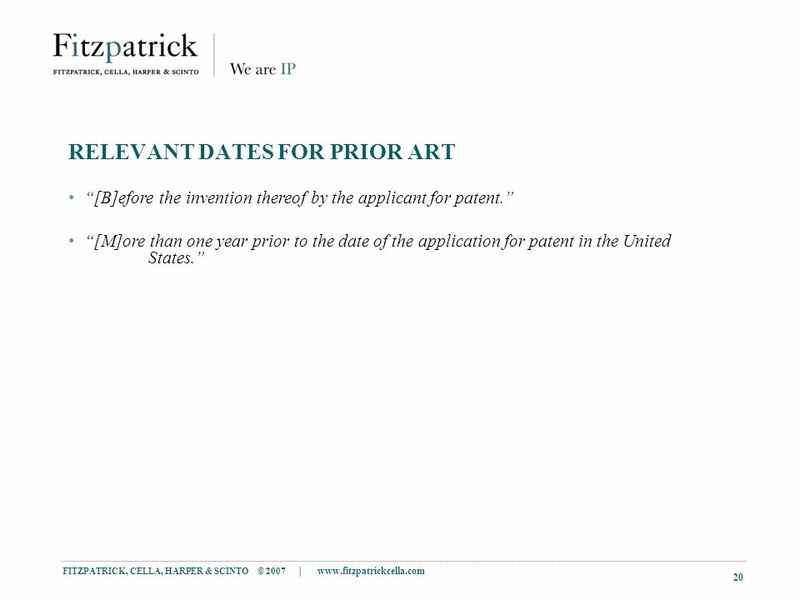 [M]ore than one year prior to the date of the application for patent in the United States. 21 FITZPATRICK, CELLA, HARPER & SCINTO © 2007 | www.fitzpatrickcella.com 21 PRIOR ART The body of knowledge that came before the subject matter sought to be patented. Frame of reference for determining whether subject matter is novel and nonobvious. 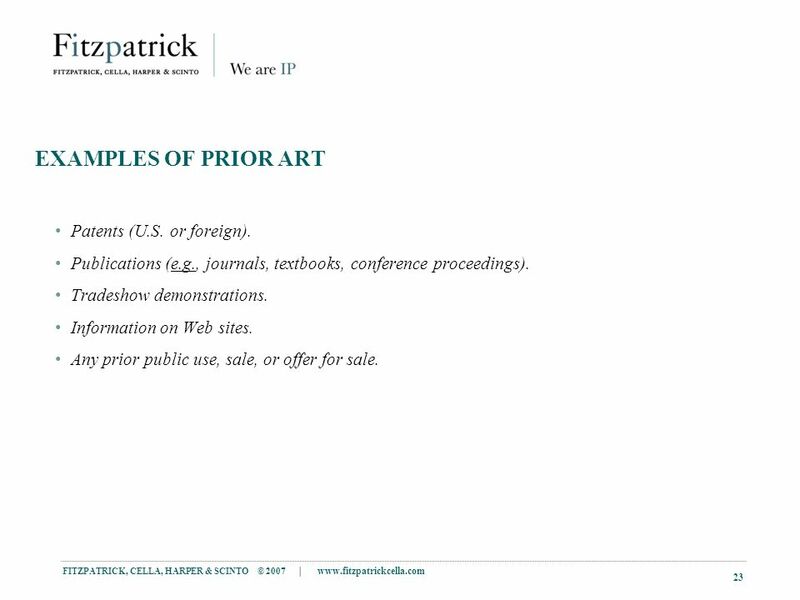 22 FITZPATRICK, CELLA, HARPER & SCINTO © 2007 | www.fitzpatrickcella.com 22 TYPES OF PRIOR ART Known or used by others. Patented or described in a printed publication. In public use or on sale. Described in a patent. Made by [another] inventor. 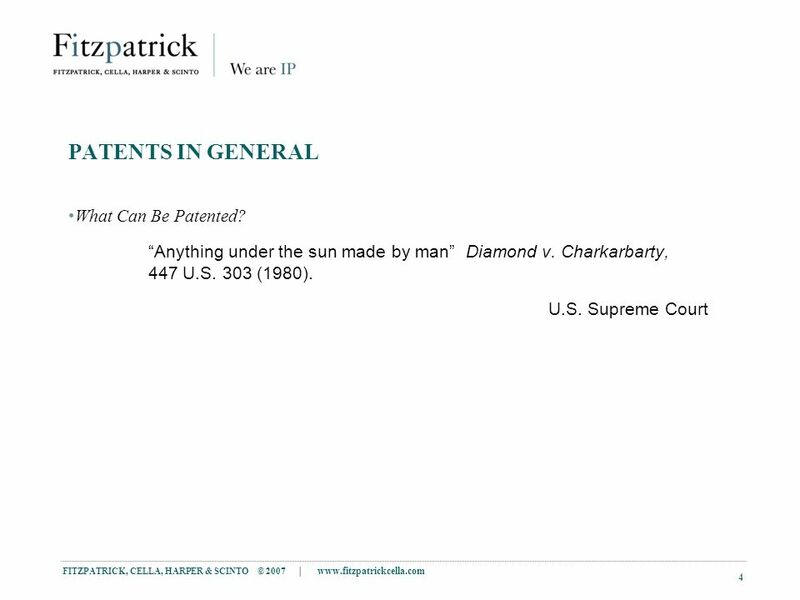 23 FITZPATRICK, CELLA, HARPER & SCINTO © 2007 | www.fitzpatrickcella.com 23 EXAMPLES OF PRIOR ART Patents (U.S. or foreign). Publications (e.g., journals, textbooks, conference proceedings). Tradeshow demonstrations. Information on Web sites. Any prior public use, sale, or offer for sale. 24 FITZPATRICK, CELLA, HARPER & SCINTO © 2007 | www.fitzpatrickcella.com 24 WHAT IS THE DATE OF INVENTION? Date of filing (constructive reduction to practice). Date of actual reduction to practice (sample, prototype, or model). 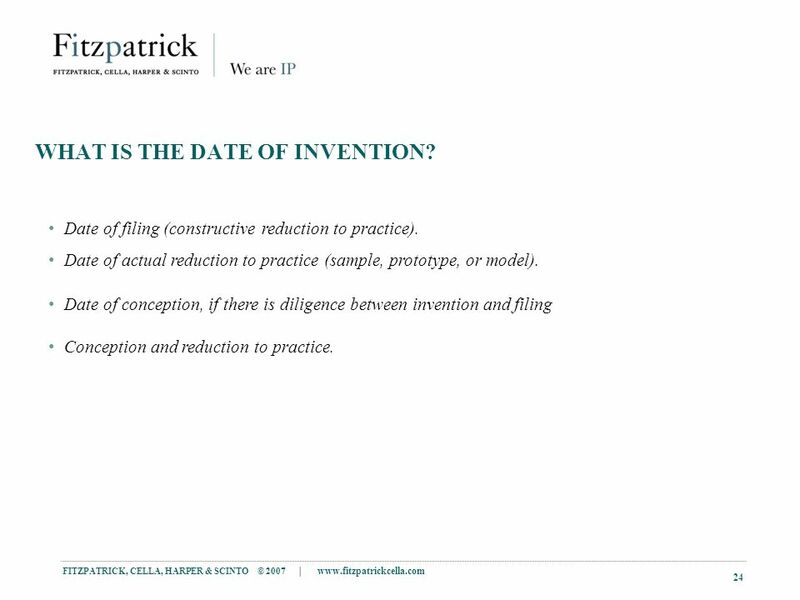 Date of conception, if there is diligence between invention and filing Conception and reduction to practice. 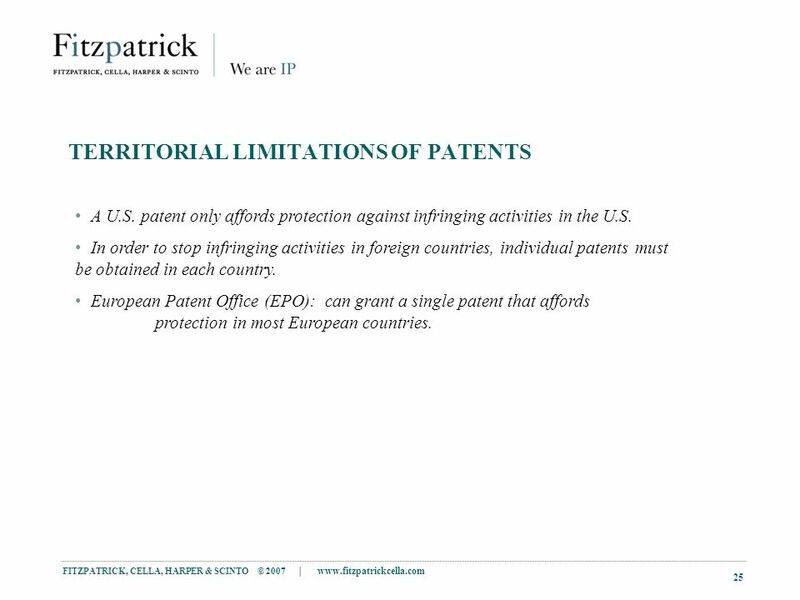 25 FITZPATRICK, CELLA, HARPER & SCINTO © 2007 | www.fitzpatrickcella.com 25 TERRITORIAL LIMITATIONS OF PATENTS A U.S. patent only affords protection against infringing activities in the U.S. In order to stop infringing activities in foreign countries, individual patents must be obtained in each country. European Patent Office (EPO): can grant a single patent that affords protection in most European countries. 29 FITZPATRICK, CELLA, HARPER & SCINTO © 2007 | www.fitzpatrickcella.com 29 Case Study: Novelty (35 U.S.C. 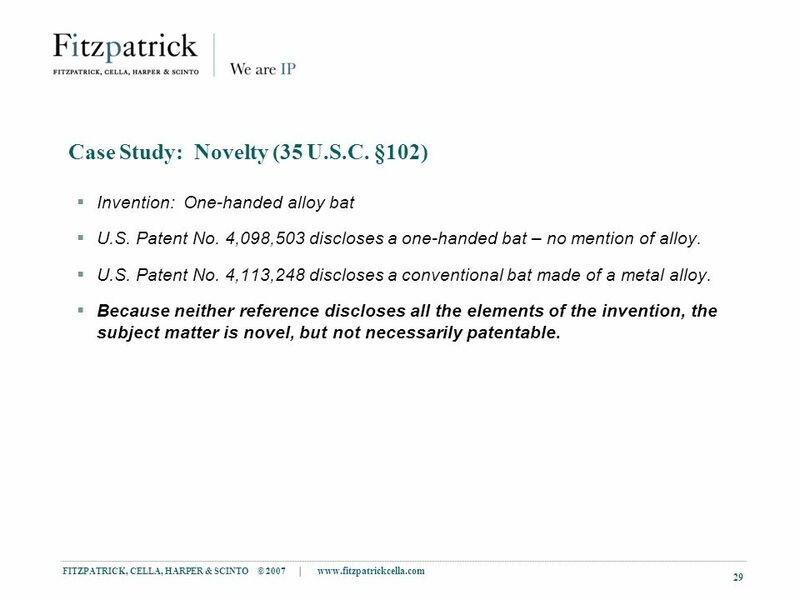 §102) Invention: One-handed alloy bat U.S. Patent No. 4,098,503 discloses a one-handed bat – no mention of alloy. U.S. Patent No. 4,113,248 discloses a conventional bat made of a metal alloy. Because neither reference discloses all the elements of the invention, the subject matter is novel, but not necessarily patentable. 30 FITZPATRICK, CELLA, HARPER & SCINTO © 2007 | www.fitzpatrickcella.com 30 Case Study: Nonobviousness (35 U.S.C. 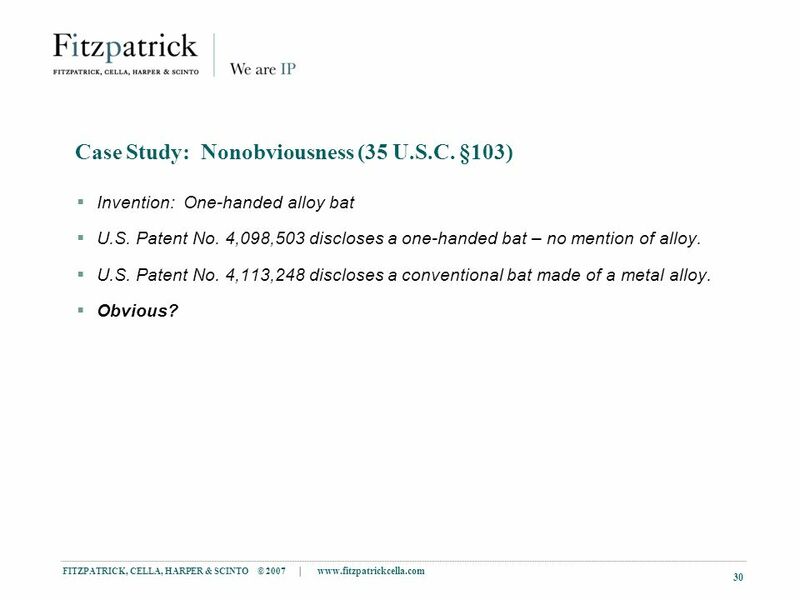 §103) Invention: One-handed alloy bat U.S. Patent No. 4,098,503 discloses a one-handed bat – no mention of alloy. U.S. Patent No. 4,113,248 discloses a conventional bat made of a metal alloy. Obvious? 31 FITZPATRICK, CELLA, HARPER & SCINTO © 2007 | www.fitzpatrickcella.com 31 Case Study: Nonobviousness (35 U.S.C. 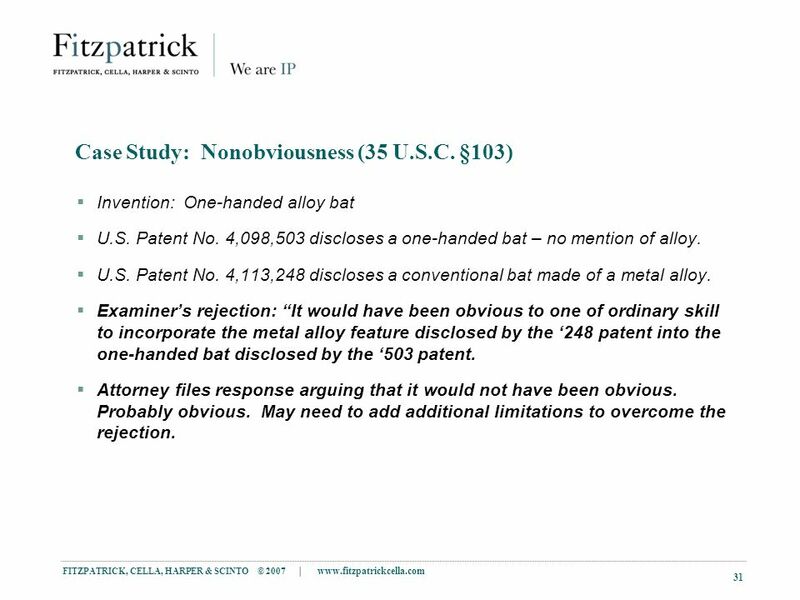 §103) Invention: One-handed alloy bat U.S. Patent No. 4,098,503 discloses a one-handed bat – no mention of alloy. U.S. Patent No. 4,113,248 discloses a conventional bat made of a metal alloy. Examiners rejection: It would have been obvious to one of ordinary skill to incorporate the metal alloy feature disclosed by the 248 patent into the one-handed bat disclosed by the 503 patent. Attorney files response arguing that it would not have been obvious. Probably obvious. May need to add additional limitations to overcome the rejection. 32 FITZPATRICK, CELLA, HARPER & SCINTO © 2007 | www.fitzpatrickcella.com 32 Case Study: Nonobviousness Invention: One-handed graphite and zinc alloy bat U.S. Patent No. 4,098,503 discloses a one-handed bat – no mention of alloy. U.S. Patent No. 4,113,248 discloses a conventional bat made of nickel alloy. Obvious? 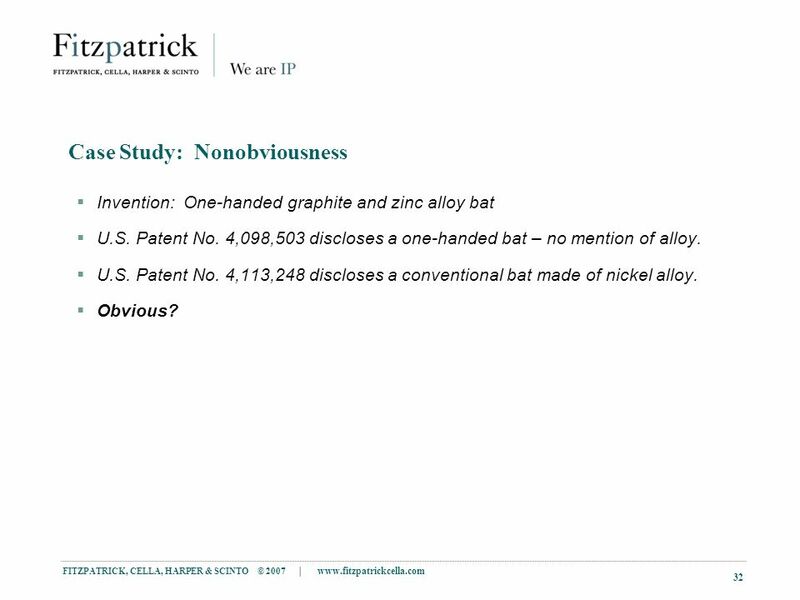 33 FITZPATRICK, CELLA, HARPER & SCINTO © 2007 | www.fitzpatrickcella.com 33 Case Study: Nonobviousness Invention: One-handed graphite and zinc alloy bat U.S. Patent No. 4,098,503 discloses a one-handed bat – no mention of alloy. U.S. Patent No. 4,113,248 discloses a conventional bat made of nickel alloy. Examiners rejection: It would have been obvious to one of ordinary skill to incorporate the metal alloy feature disclosed by the 248 patent into the one-handed bat disclosed by the 503 patent. Attorney files response arguing that it would not have been obvious because there are multitudes of possible metal alloys and the skilled artisan would not have chosen a graphite/zinc alloy. 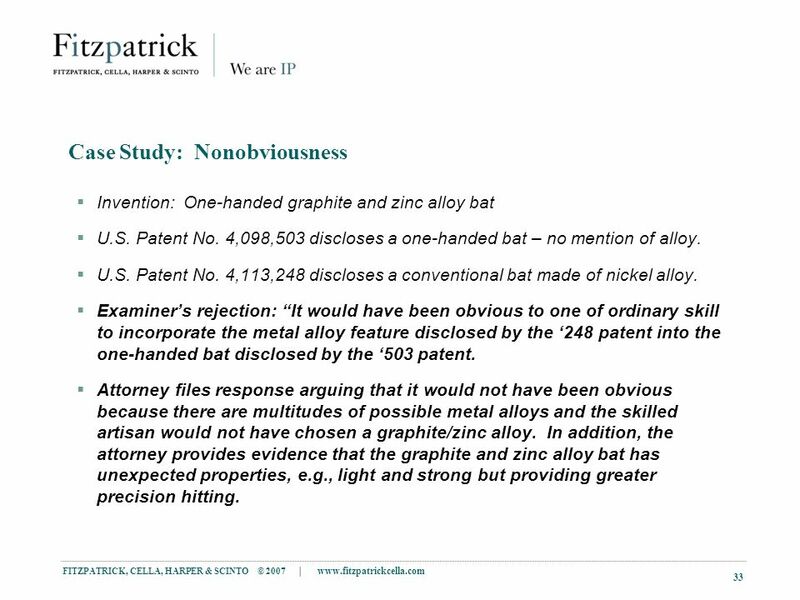 In addition, the attorney provides evidence that the graphite and zinc alloy bat has unexpected properties, e.g., light and strong but providing greater precision hitting. 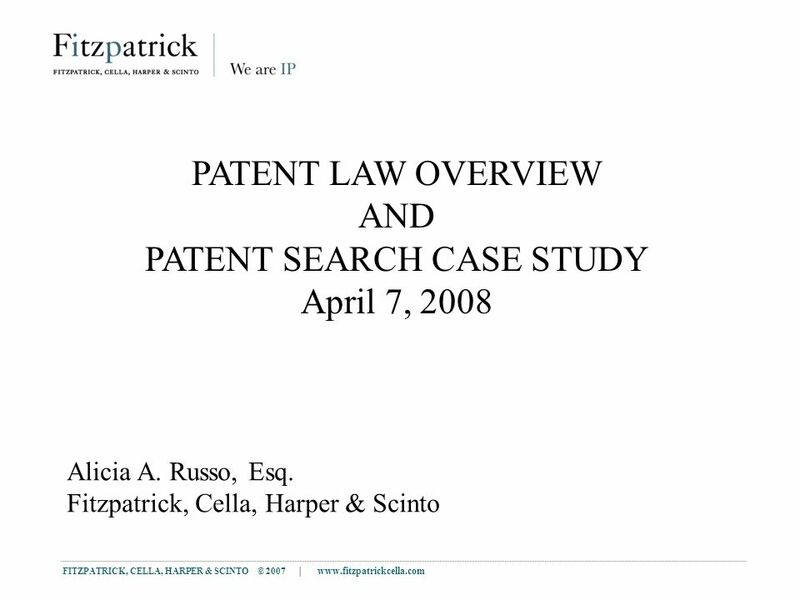 Download ppt "FITZPATRICK, CELLA, HARPER & SCINTO © 2007 | www.fitzpatrickcella.com 1 PATENT LAW OVERVIEW AND PATENT SEARCH CASE STUDY April 7, 2008 Alicia A. Russo,"
Technology Center 1600 Training on Writing Rejections Under 35 U.S.C. § 103. 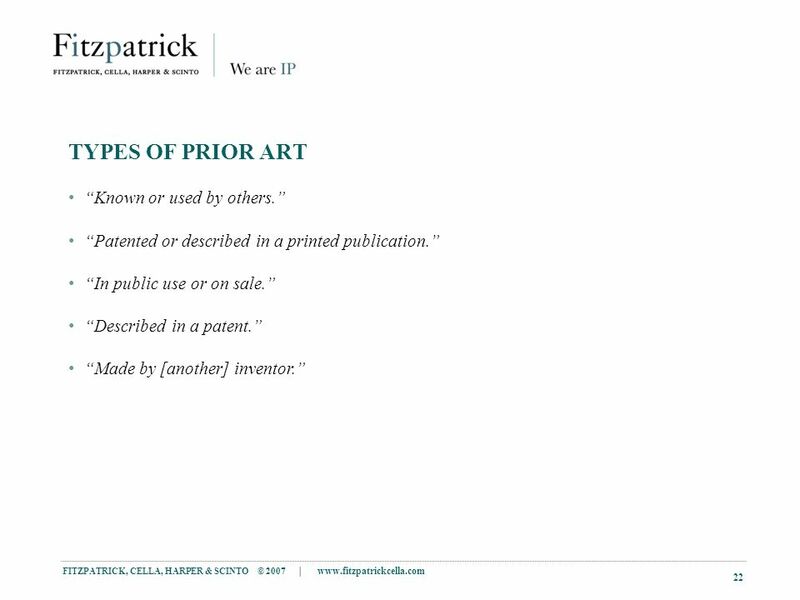 Ethical aspects and Patents in Lifescience Peter R. Thomsen Manager Global IP Litigation, Corporate Intellectual Property, Novartis WIPO symposium on IP. 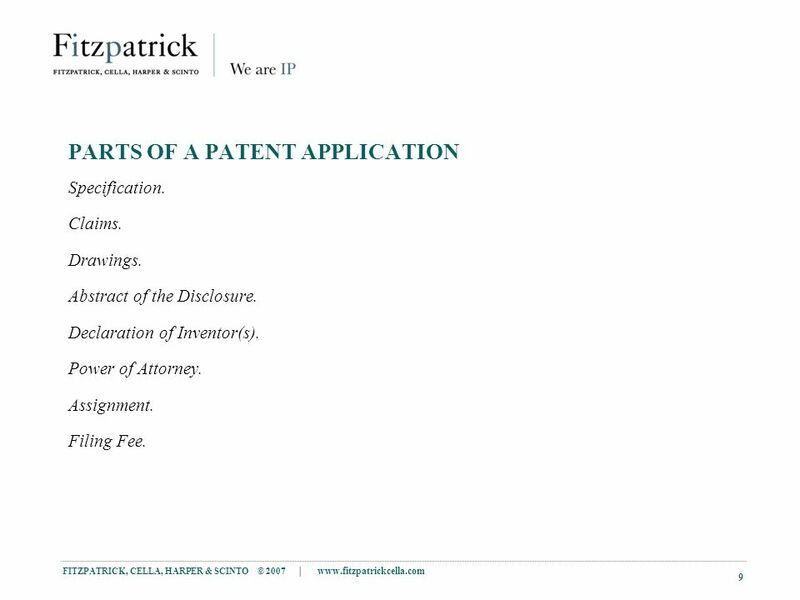 Disclaimer: The information provided by the USPTO is meant as an educational resource only and should not be construed as legal advice or written law. Recent Developments In Parties Obligations In Hatch-Waxman Act Litigation Brian V. Slater Presented at American Conference Institutes Maximizing Pharmaceutical. William Boshnick Greenblum & Bernstein, P.L.C. Welcome to the FICPI ABC Conference © Birch, Stewart, Kolasch & Birch, LLP KSR v. Teleflex: U.S. Supreme Court Decision Raises Patentability Standard. 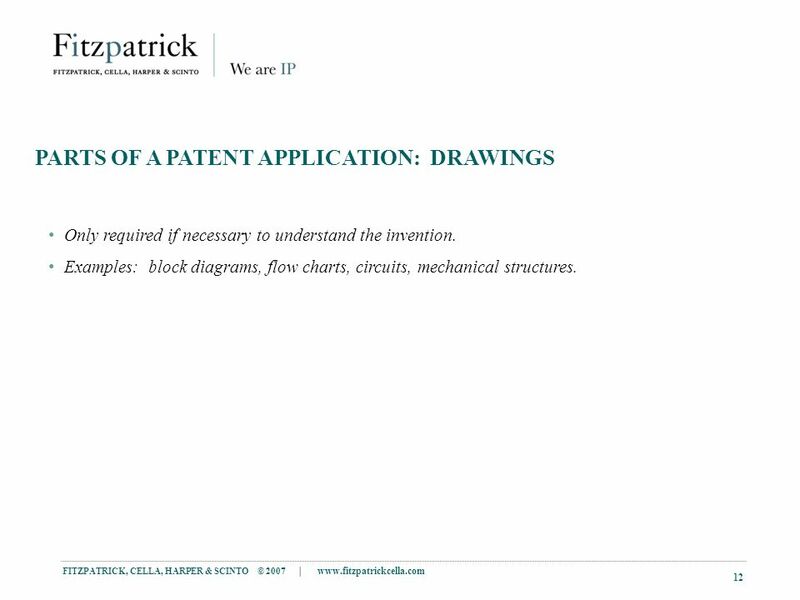 Intellectual Property Fundamentals Ed Genocchio - Principal of Spruson & Ferguson - Mechanical Group Presentation to The Australian Technology Showcase. Science as a Process Chapter 1 Section 2. June 8, 2006 PATENTS: WHAT YOU SHOULD KNOW Steven R. Ludwig, Ph.D., Esq. INTELLECTUAL PROPERTY PROTECTION OFFICE OF PATENT COUNSEL March 16, 2001. Implementing First-Inventor-to-File Provisions of the AIA By: Scott D. Malpede, Seth Boeshore and Chitra Kalyanaraman USPTO Rules Effective March 16, 2013.